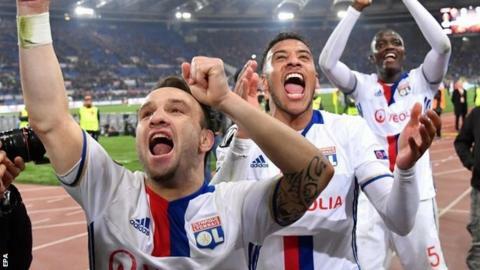 Roma fell just short of a comeback as Lyon knocked them out in the Europa League last 16. The second-placed Serie A side trailed 5-2 on aggregate when Mouctar Diakhaby headed the French side into the lead on the night. But Kevin Strootman prodded home an immediate equaliser and a Lucas Tousart own goal narrowed the gap but Roma could not find a late strike to take them through on away goals. Edin Dzeko fired a late chance over. Schalke came from 2-0 down, and 3-1 on aggregate, to beat Bundesliga rivals Borussia Monchengladbach on away goals. Andreas Christensen and Mahmoud Dahoud had put Gladbach in control before Leon Goretzka's strike and Nabil Bentaleb's penalty. Ryan Babel scored his first two European goals since 2010 as 10-man Besiktas beat Olympiakos 4-1 in Istanbul, 5-2 on aggregate. Celta Vigo, Spain's only representatives left in the tournament, beat FK Krasnodar 2-0 in Russia to progress 4-1 overall. Bertrand Traore and Kasper Dolberg scored as Ajax beat FC Copenhagen 2-0 to overturn a 2-1 first-leg deficit to progress. Anderlecht beat Apoel Nicosia 1-0 (2-0 on aggregate), while Genk beat fellow Belgians Gent 6-3 on aggregate after a 1-1 second-leg draw. Manchester United beat FC Rostov 1-0 to go through 2-1 overall. Match ends, Roma 2, Lyon 1. Second Half ends, Roma 2, Lyon 1. Offside, Lyon. Anthony Lopes tries a through ball, but Nabil Fekir is caught offside. Attempt blocked. Stephan El Shaarawy (Roma) left footed shot from the centre of the box is blocked. Assisted by Edin Dzeko. Attempt blocked. Stephan El Shaarawy (Roma) right footed shot from the centre of the box is blocked. Assisted by Francesco Totti. Corner, Roma. Conceded by Lucas Tousart. Attempt blocked. Edin Dzeko (Roma) right footed shot from the centre of the box is blocked. Assisted by Stephan El Shaarawy with a cross. Corner, Lyon. Conceded by Kevin Strootman. Corner, Lyon. Conceded by Alisson. Attempt saved. Nabil Fekir (Lyon) right footed shot from the right side of the box is saved in the bottom right corner. Assisted by Christophe Jallet. Attempt missed. Edin Dzeko (Roma) header from the centre of the box is just a bit too high. Assisted by Diego Perotti with a cross. Substitution, Lyon. Rafael replaces Mathieu Valbuena. Diego Perotti (Roma) is shown the yellow card. Attempt missed. Stephan El Shaarawy (Roma) right footed shot from the centre of the box is too high following a corner. Corner, Roma. Conceded by Christophe Jallet. Anthony Lopes (Lyon) is shown the yellow card. Corner, Roma. Conceded by Anthony Lopes. Substitution, Lyon. Nabil Fekir replaces Alexandre Lacazette. Substitution, Roma. Francesco Totti replaces Daniele De Rossi. Attempt blocked. Edin Dzeko (Roma) right footed shot from the centre of the box is blocked. Assisted by Stephan El Shaarawy. Maxime Gonalons (Lyon) wins a free kick in the defensive half. Substitution, Lyon. Mapou Yanga-Mbiwa replaces Emanuel Mammana because of an injury.